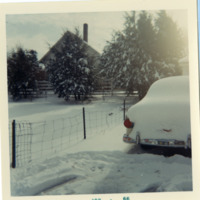 A parked car alongside a fence, covered in snow. 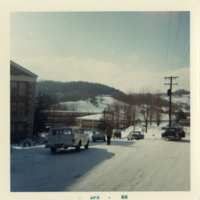 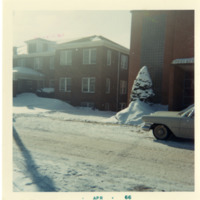 An inscription written on the back of the photograph reads: "Car at apt on Howard St, Boone, N.C. Jan, 1966." 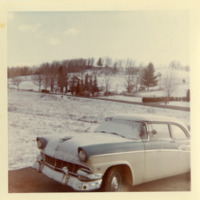 A parked 1955 or 1956 Ford Fairlane in the snow. 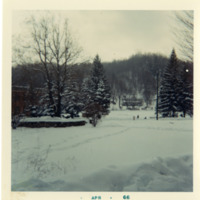 A field and building are visible in the distance. 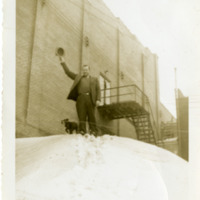 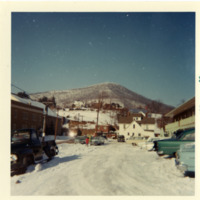 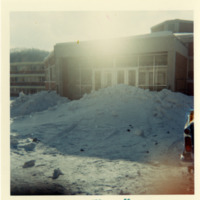 An inscription written on the back of the photograph reads: "The country, Boone/April 1966-Where I lived." 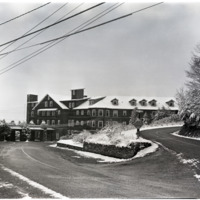 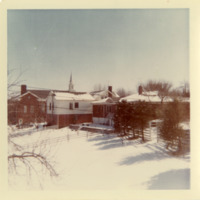 Nearly identical to Pal-Bla-10-053, this image shows Mayview Manor as seen from a fork in the road on a snowy day in March 1957.